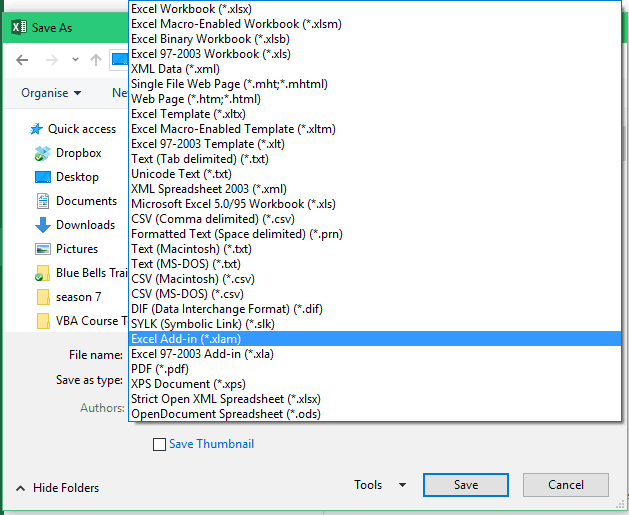 If you work with Excel worksheets that have a lot of cell comments in a worksheet, this tutorial could be useful. Sometimes you may insert cell comments to highlight or explain data, or your boss may insert comments in cells while reviewing your work. If you have a huge dataset and the comments are scattered all over the worksheet, it may help to have all comments in a single place as a list. 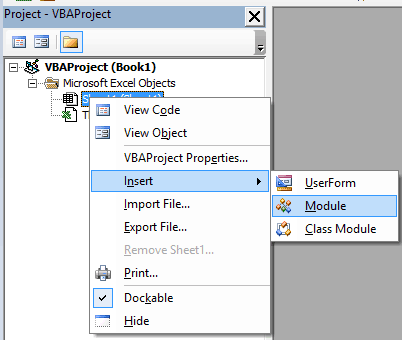 In this tutorial, I will show you how to use a VBA code to get a list of all the comments in a Worksheet in a separate worksheet. It checks whether there are any comments in the active worksheet or not. If there are no comments, it quietly bows out and does nothing. Column A has the cell address that has the comment. Column B has the commenter name. This comes in handy if there are multiple reviewers of the same file. It will also help filter/sort based on reviewers name. Column C has the comment. Here is the VBA code that does all the heavy lifting here. Copy paste your data (as is) in the Data tab of the download file and then run this macro. Go to the Developer tab and click on Macros. It will open the Macro dialogue box. Select ExtractComment and click on Run. Make sure you are in the sheet that has the comments that you wish to extract. Copy the code and paste it in the workbook from which you want to extract the comments. Activate the workbook in which you are working and press Alt + F11. This will open the VB Editor window. In the Project Explorer on the left, right-click on any of the objects for that workbook, go to Insert –> Module. Close the VB Editor Window (or press Alt + F11 to go back to the worksheet). Now you have the macro in your workbook. To run the macro, go to Developer Tab –> Macros. 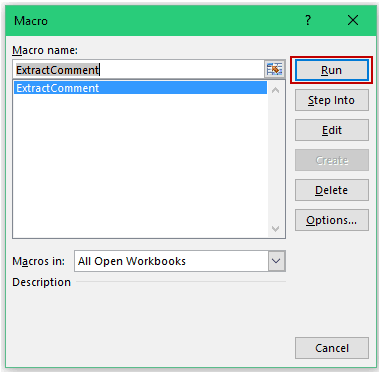 In the Macro dialogue box, select the ExtractComment macro and click in Run. Note: Make sure you save the workbook with .XLS or .XLSM extension. If you need to use this code often, it’s best to create an add-in out of it. That way you can easily use it in any workbook (without the additional effort of copy pasting the code again and again). 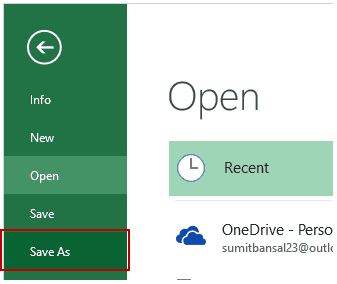 Go to File –> Save As. In the Save As dialogue box, change the Save as type to .xlam. You’ll notice that the path of the file where it gets saved automatically changes. You can change it if you want. Once an add-in has been activated, you can use it in any workbook. To do that, go to Developer –> Macros. 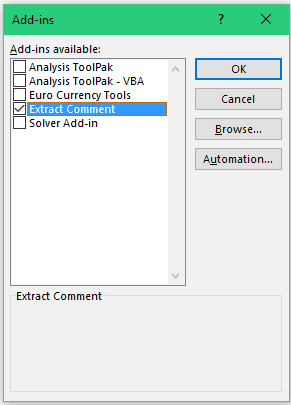 In the Macro dialogue box, select the ExtractComment macro and run it. Hope this code will save you some time. Let me know your thoughts in the comments section. If you work with Excel, VBA could be a powerful ally. Take your Excel Skills to the next level with the VBA JetPack Course. 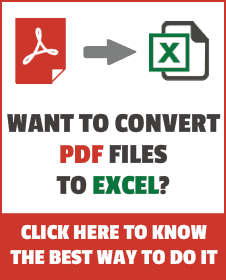 Excel VBA Tips and Tutorials. Thanks for the script, it’s very useful. Could you tell me please how I may append the worksheet name to the cell address, since I have many worksheets. I have modified the code but you will need to adjust it based on your requirements. is it possible without VBA ? Hello Deepak.. I don’t think this it can be done without VBA.